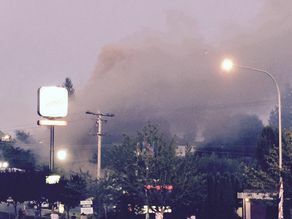 BREMERTON, Wash. --An explosion demolished part of a Motel 6 in Bremerton, Washington, on Tuesday night - critically injuring a gas company worker just minutes after the hotel was evacuated due to a leak. CBS Seattle affiliate KIRO-TV reports that three people were unaccounted for. "The management did a really good job of getting the alarm in right away and getting the evacuation started," said Bremerton Police Chief Steve Strachan. "We're very thankful there weren't more injuries." The motel's manager, Tonya Hinds, said in a telephone interview that a passerby had come into her office to say a gas line was leaking at the back of the building. Hinds - a former volunteer firefighter - said she went outside and saw that the leaking line was a big one "with a lot of gas." KIRO reports investigators are working to determine the cause of the gas leak.